Thousands of people have flooded the streets of EU cities in mass demonstrations expressing solidarity with Greece ahead of this weekend’s referendum on a cash-for-reform deal with its Troika of creditors. 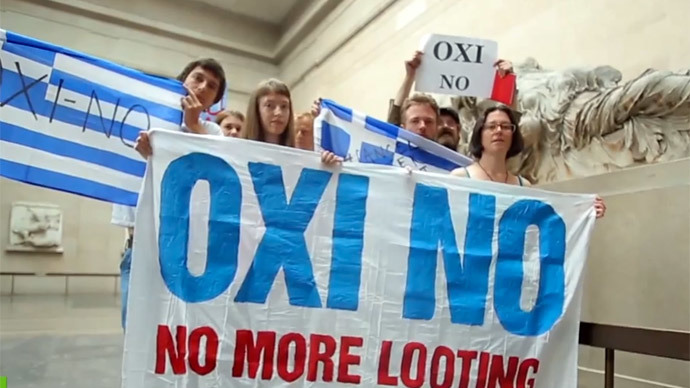 “We’re here to say OXI to the modern-day looting of Greece through forced austerity and privatization to pay off the reckless loans of European banks,” said Jonathan Stevenson from the Jubilee Debt Campaign while taking part in the protest. Hundreds of demonstrators gathered in Glasgow chanting “From Glasgow to Greece, no justice no peace” and “the Troika says cut-back, we say fight-back. “The Troika and the corporate media are attempting to blackmail the Greek people, so acts of solidarity like today are important in letting Greeks know that they are not alone,” Jonathon Shafi from the Radical Independence Campaign, which organized the protest, told CommonSpace News Service. On Sunday, Greeks will vote on whether the government should accept their creditors’ bailout terms. If they vote ‘Yes’ the current government is likely to resign and the people will have to accept the harsh austerity measures demanded by the Troika, including additional wage and pension cuts. However, a ‘No’ vote would likely lead to Greece’s exit from the eurozone and potentially the EU, consequently raising questions about the viability of the euro. Greece, which has been in crisis since 2009, was supposed to make an IMF loan payment of €1.6 billion by July 1st but failed to do so. It is scheduled to make another major payment of €3.5 billion to the ECB on July, 20. The biggest demonstration regarding the referendum so far occurred on Friday, with at least 25,000 people rallying in Athens for a “No” vote, while about 20,000 “Yes” supporters gathered, police told AFP. The latest Ipsos poll shows that 44 percent of the Greeks say “Yes” to remaining part of the eurozone at any cost, while 43 percent are against.